After struggling for more than two centuries to tame the inhospitable islands where they washed up, the descendants of the survivors of a lost passenger ship are now striving to tame a more substantial "Mainland" they have found. For as long as mankind has been stranded, dragons have been their sworn enemies. Sixteen year-old Jenka De Swasso wants nothing more than to follow in his father's footsteps and become a King's Ranger. But when he one day finds himself surrounded by vicious trolls, a young pure-blood dragon comes to his rescue and they become bond-mates. Meanwhile, the goblins have a new king, Gravelbone, and have allied themselves with the tainted "mudged" dragons to drive mankind out of its lands. Setting his sights on a vast manmade wall, Gravelbone and his wicked hell-born Nightshade, seek to poison the entire human kingdom and enslave any survivors. Jenka and his companion, a druida warrior named Zah, soon realize that they and their bonded dragons are mankind's only hope for survival. Forced to defy their arrogant king's wishes, the pair set out on a desperate quest to stop Gravelbone's forces and save mankind from its terrifying fate. With action so intense you'll forget to breathe and intrigue around every corner, The Royal Dragoneers is one adventure you cannot miss. Hold on to your dragon... your journey is about to begin! ©2010 Michael Robb Mathias Jr. (P)2013 Michael Robb mathias Jr. The narrator makes the story so horrible to listen to. Good story line just the voice that makes it bad. A well written, and well told action-fantasy. What made the experience of listening to The Royal Dragoneers the most enjoyable? The story was great. A village boy and some others turn into dragon riders to save a land from a troll who is trying to poison them. What was one of the most memorable moments of The Royal Dragoneers? When the young dragon Jade gets chastised and then takes off on his own. I was scared for that juvenile wyrm, more than I'd like to admit. Have you listened to any of Christine Padovan’s other performances before? How does this one compare? I heard her read Mathias' Crimson and Clover on youtube. Absolutely. Each chapter ends in a way that compels you to keep going. 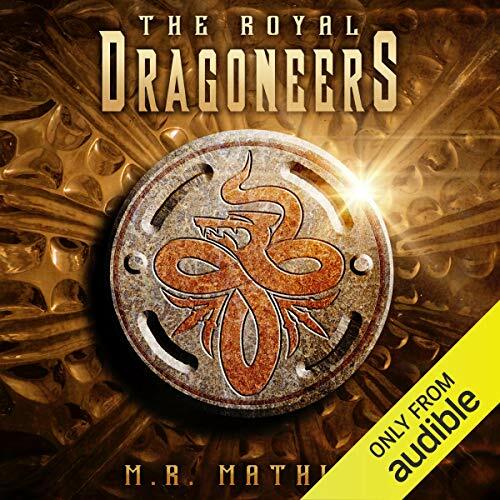 This is the second M. R. Mathias audio book I have listened to. In both the narrators use voices for the characters. This is okay but distracting at times. It also lends to the drama and anticipation at times too. Mathias' stories are somehow traditional fantasy yet told in a very refreshing way. I hope all four of his fantasy series make it to audio format. can't wait to hear the next one. Good book. Great what's next?......?????? just getting started. exciting and fun and I will be back. thanks. Yes, I enjoyed the story very much. I found the narrator's reading style annoying to listen to. She read in strange surge-like phrases that were distracting. I was almost like a computer was reading to me. The story, though feeling a bit generic at times, was very entertaining, and I enjoyed the adventure. But the narrator, I don't know what she was thinking. Having Siri read the book would be a better choice. I have no idea if the book is any good. The narrator is so bad that I stopped listening in less than 5 minutes. Her lack of emotion and slow speech made me think she had just learned to read or was trying to read while not showing she was on pot. Or perhaps she was just trying to sound like a make, which would explain the low slow voice, which doesn't sound real. What disappointed you about The Royal Dragoneers? I did not like the way Christine read the book. the puncuation on the last word of every sentence drove me nuts.I will not try the other books if she is reading them. the person reading was to herky jerky. the narrator made it hard to follow but story was good. her readin g was to herky jerky. Christine Padovan did a masterful job of bringing all the characters to life. I strongly suggest anyone reading this book to get the Audible companion. The story is great. I have really come to enjoy this author. But I will not listen to another book read by this narrator. She narrates as if reading to preschoolers. She pauses in all the wrong places and doesn't provide a good range of voices. She slurs words a lot. Other than that I would recommend this book and author to any fantasy lover. I will be finishing the series but I'll be reading it instead of listening. The idea of the book was good but the narration, the childlike character and non engageing story put me off, I had to force myself to finish the story.